The French novelist Jules Verne (8 February 1828 – 24 March 1905) is the second-most translated author of the last 50 years, just behind Agatha Christie and it’s easy to see why. The sense of spectacle and wonder weaved in his novels has near universal appeal – appearing in countless adaptations from the early age of moving pictures through to the 21st century. 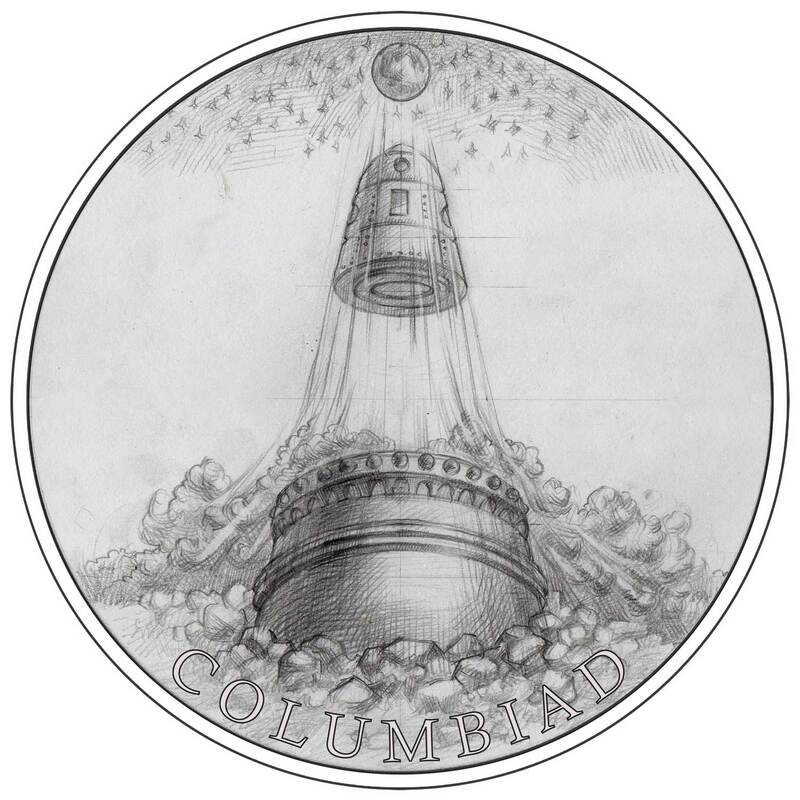 As a literary world full of wonder, Jules Vernes work is a perfect subject for a coin series. The Czech Mint has launched the first of a four-coin set showcasing some of the fantastical devices that sprang onto the pages of Verne’s science-fiction novels. To kick off the series, the mint has chosen the most well known of them all – the submarine called Nautilus from the superb 1870 novel, 20,000 Leagues Under the Sea. Telling the story of a renegade genius, Captain Nemo, and his attempt to punish civilisation for what it had done to his family, it’s an incredibly forward-looking work, with the Nautilus having several features that were unknown at the time but have since been invented and implemented on modern submarines. 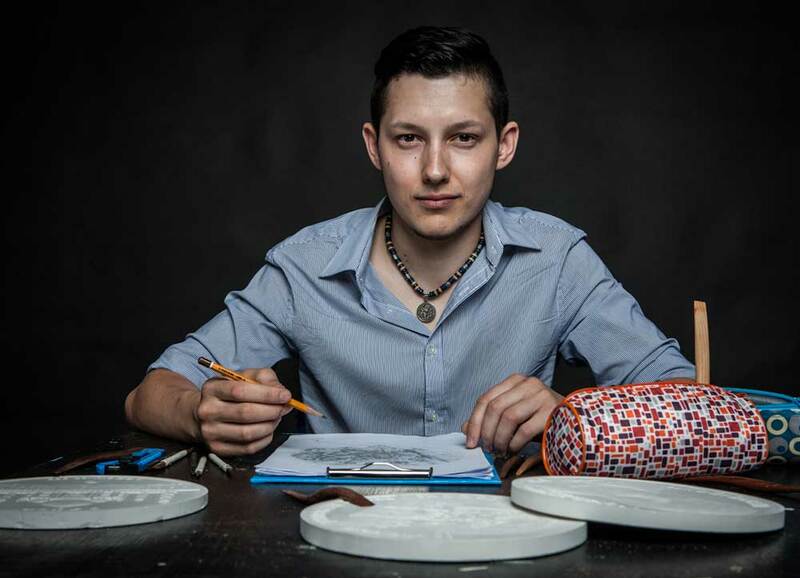 The design of the coins in this series is by Russian artist Asamat Baltaev, also responsible for the Czech Lion silver bullion coin last year. He’s done a fantastic job in our view. The Nautilus coin is a hugely dynamic piece and one not afraid to mix traditional and stylistic touches to create a greater whole. The mint has done an outstanding job with the strike, choosing to keep all but the coin title on the obverse face to allow the design to fully breathe. 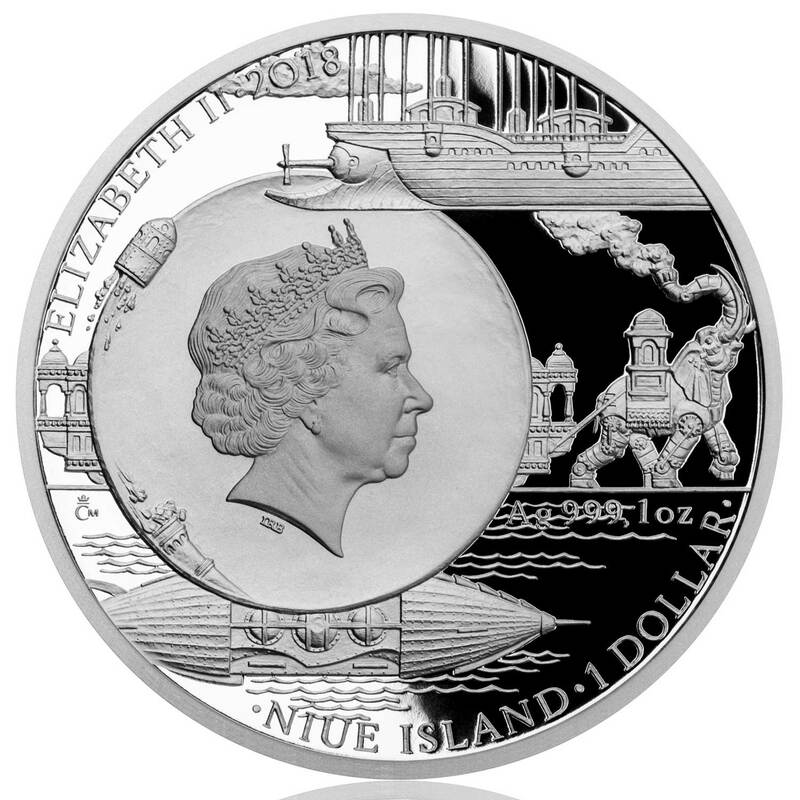 The obverse will be a common one to the series and as a Niue issue features the mugshot of QEII in its centre. 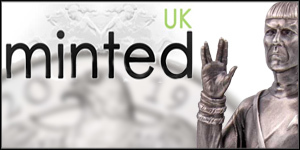 Again, the mint has done an exceptional job merging the effigy with a heavily themed set of series elements – outstanding work. 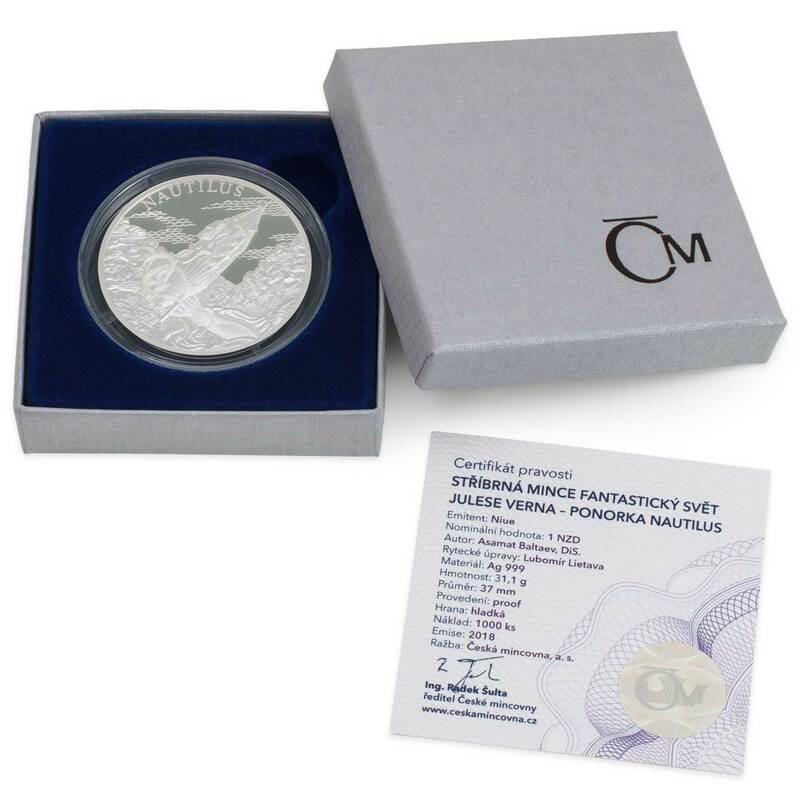 The coin comes in a small box with an enclosed certificate of authenticity – one much like those used by the Austrian Mint. 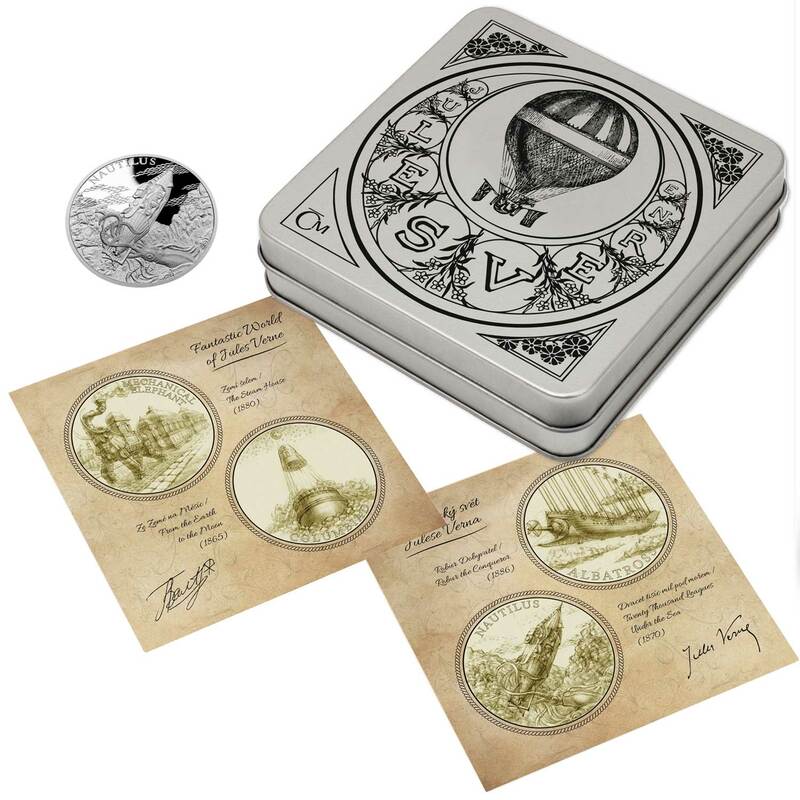 Those collecting the whole set will likely prefer the themed tin that holds all four coins. Selling for just €8 Euro, it’s good that the mint has resisted the urge to charge an extortionate amount for it and the enclosed artwork is a nice touch. As for the rest of the series, you can see the concept art below and they all look great. 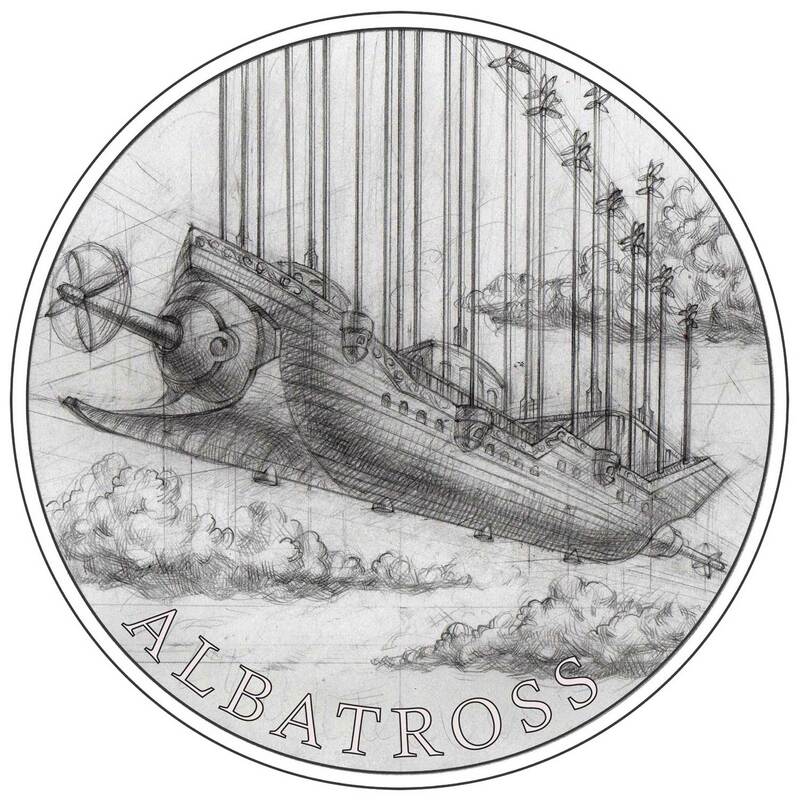 The Albatross coin will ship in May, the Mechanical Elephant in June, and the Columbiad in September. This looks like it will shape up to be a first-class issue. The Nautilus coin is available to order now from the Czech Mint website and the mintage is limited to just 1,000 pieces. Jules Verne enthralled the world by stories of extraordinary inventions that overtook their time in the 19th century. Although we often take them for granted, we are happy to recollect unforgettable adventures. 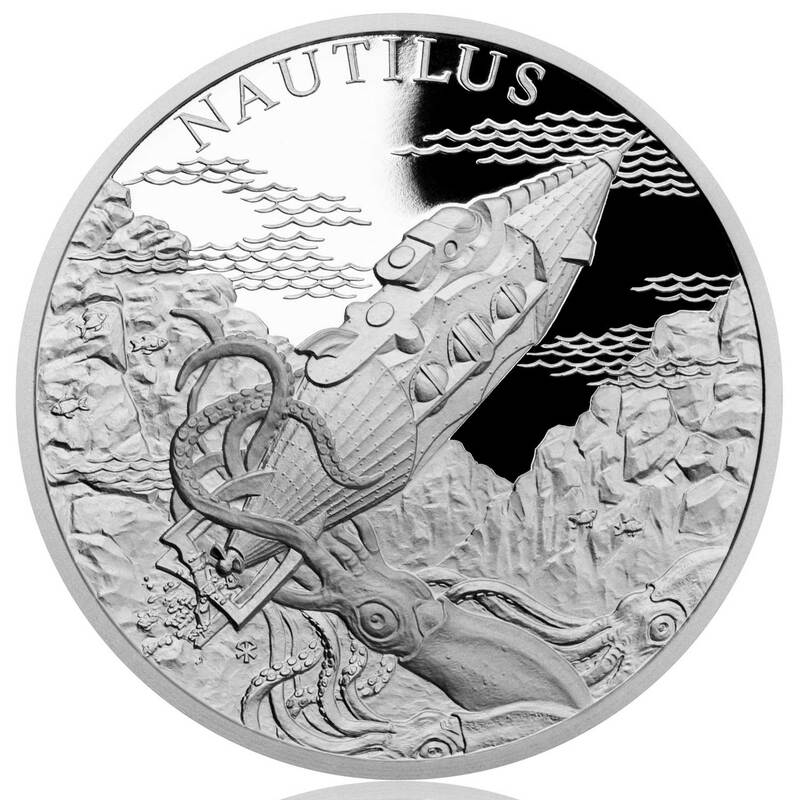 A silver coin from the Czech Mint´s new miniset, which is devoted to Nautilus submarine, will bring you to the first expedition of “Fantastic World of Jules Verne”. The legendary undersea vessel is used by mysterious captain Nemo in order to fight against the earthly tyrants that represent the world´s colonial powers. 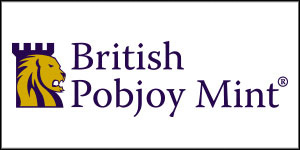 A bitter man, whose name means Nobody in Latin, is in fact a warrior from India, which had been repressed by England for centuries. Nemo´s victims have long been mistaken when believed that an unknown aggressive beast attacked them. It sank the ships by broking their hips through the armoured fore of the submarine until the american expedition attempting to harpoon the metal monster found its honor. So the story of the French novel “Twenty Thousand miles Under the Sea” begins. Verne’s description of the submarine is so precise that it could fit even the current machine. There is also a ballast tank system, electromagnetic propeller, sodium battery cells, or oxygen production devices based on electrolysis of water. All this was in 1870. How could Verne predict? He had an extraordinary curiosity and limitless imagination. He was interested in technological progress, while carefully studying the model of the French submarine vessel Plongeur at the World Exhibition in Paris in 1867. He certainly did not overlook the fate of the Confederate vessel Hunley, which carried out the first successful underwater attack in history during the American Civil War in 1864. From the novel Robur the Conqueror published in 1886, the Albatross is a huge, battery-powered, multirotor gyrodyne. It has many vertical airscrews to provide lift, and two horizontal airscrews in a push-pull configuration to drive the vessel forward. Robur was intent on proving the superiority of heavier-than-air flying machines over the baloons and dirigibles championed by others and the novel tells his story. He is called Robur the Conqueror because he had ‘”made conquest of the air,’. A sequel called Master of the World, was published in 1904. The Steam House is an 1880 Jules Verne novel recounting the travels of a group of British colonists in the Raj in a wheeled house pulled by a steam-powered mechanical elephant. Verne uses the mechanical house as a plot device to have the reader travel in nineteenth-century India. 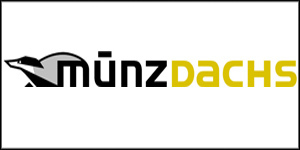 The descriptions are interspersed with historical information and social commentary. The book takes place in the aftermath of the Indian Rebellion of 1857 against British rule, with the passions and traumas aroused still very much alive among Indians and British alike. An alternate title by which the book was known – “The End of Nana Sahib” – refers to the appearance in the book of the historical figure—Rebel leader Nana Sahib—who disappeared after the crushing of the rebellion, his ultimate fate unknown. Verne offers a fictional explanation to his disappearance. In Jules Verne’s novel From the Earth to the Moon, published in 1865, a giant columbiad space gun is constructed in Tampa, Florida after the American Civil War, with the purpose of striking the Moon. Although the cannon is originally designed to fire a hollow aluminum ball, a bullet-shaped projectile is later designed with the purpose of carrying people. This fictional columbiad is made of cast iron six feet (1.83 m) thick, is 900 feet (274 m) long, and has a bore with a diameter of nine feet (2750 mm). It weighs more than 68,000 tons and is therefore cast directly in the ground, rather than being mounted on rails. The cannon is then loaded with 400,000 pounds (180,000 kg) of “pyroxyle” (gun cotton) to give the projectile sufficient velocity to leave Earth’s atmosphere and reach the Moon. A successful medal maker Asamat Baltaev, DiS became the author of the adventurous commemorative coin. 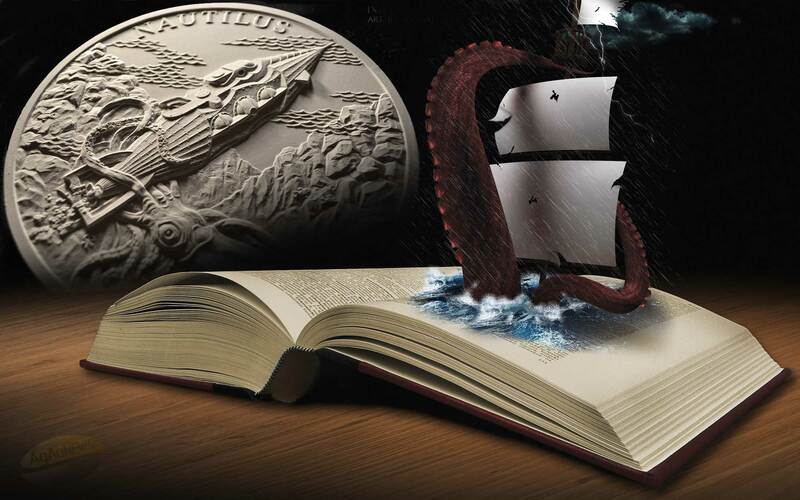 The reverse side is dominated by NAUTILUS trapped in the grip of a giant squid, which is one of the classic scenes of the novel. 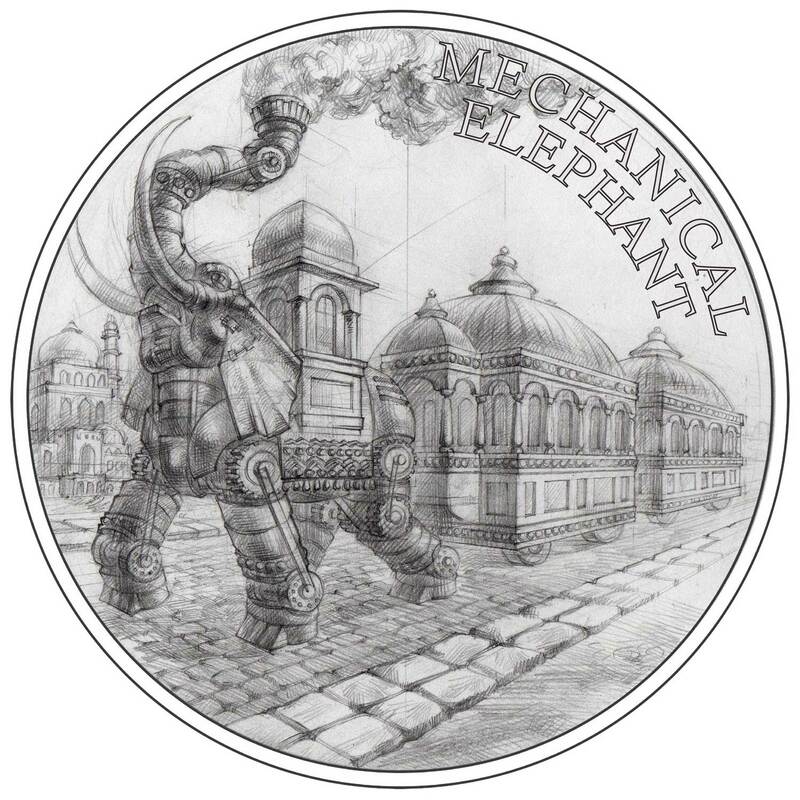 The obverse side of the coin is then a showcase of inventions that will gradually emerge in the “Fantastic World of Jules Verne” miniseries. Alongside the Nautilus submarine you will find an airship Albatros, a mechanical steam elephant and moon cannon Columbiad. All of this is linked to the attributes of Niue Island, which is the coin issuer. Since the coins of the Czech Mint are based on this foreign license, they bear the name and portrait of Queen Elizabeth II, the nominal value of 1 DOLLAR (NZD) and the year of the issue 2018. All four coins can be stored in a stylish collector’s box, which is otherwise made of metal. Its cap is decorated with graphics of old novels by Jules Verne, and you will find a spectacular illustrated attachment inside.